There is no shortage of entertainment for the little tykes. 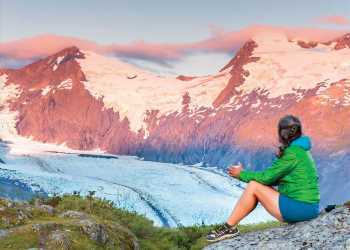 Anchorage is a casual, family-friendly city with activities to keep young visitors happy and everyone entertained during the long summer days. Make memories that will last a lifetime with this two-day family itinerary. It’s all about the science of having fun. Get hands-on with science inside the Discovery Center at the Anchorage Museum. Stand inside a bubble, form your own volcano or learn the principles of physics while playing with big toys. Explore the universe as a family; the museums planetarium shows zip through the cosmos. Imagination powers the mini-rocket at the space-themed Valley of the Moon Park at 17th Avenue and E Street, one of the Anchorage&apos;s 223 parks where kids can run off excess energy, play catch or enjoy a family picnic. Warm summer breezes lift giant colorful kites in Delaney Park, a long, broad strip of green space an the southern side of downtown. Lumbering, majestic gorillas stand statuesque guard at Charles Smith Memorial Park at C Street and Chester Creek. Huge burritos, family friendly fare, and movies on the big screen during dinner (not to mention scratch made drinks and local beer for the adults) all at Bear Tooth Theatrepub. Head over to Alaska Wild Berry Products for a sweet treat and a look at a giant chocolate waterfall. Rent bikes and pedal down the Tony Knowles Coastal Trail, an 11-mile trail that follows Cook Inlet from downtown to Kincaid Park – home to its own network of unpaved and wooded trails. What does a grizzly bear eat? How do otters keep warm? Find out on the Alaska Zoo Discovery Tour, just one of the many programs that engage visitors in learning more about arctic and sub-arctic wildlife. Or, get nose-to-nose with the newborn critters at the Alaska Wildlife Conservation Center, a 140-acre wildlife park just 40 miles south of downtown Anchorage. Hey sports fans! Anchorage has three collegiate summer league baseball teams, a professional hockey franchise and great college sports action – basketball, gymnastics, hockey, swimming, skiing, track and field and volleyball. Cheer for the home team, or follow your favorite squad on a visit to Alaska.